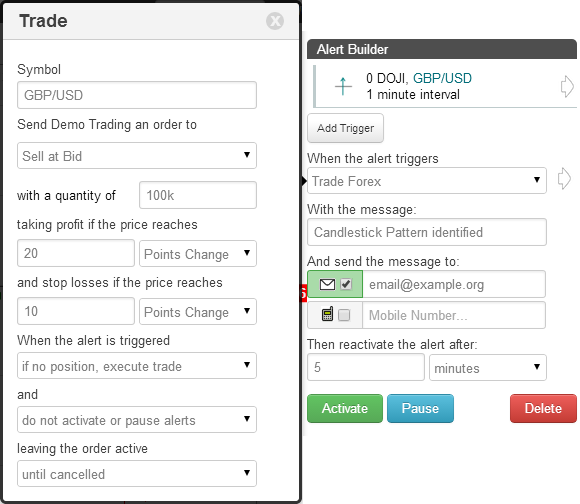 Use timetotrade to set up trading rules and receive alerts to your email or mobile phone as soon as your RSI investment conditions are met. You can set up RSI alerts to notify you, or execute trades, when the RSI is overbought or oversold; if RSI forms a V with a sudden change in direction; combine RSI with other indicators such as the Moving Average to create an alert that will tell you if the market is overbought or oversold in a trending market. You can also quickly backtest your alert based trading strategies. 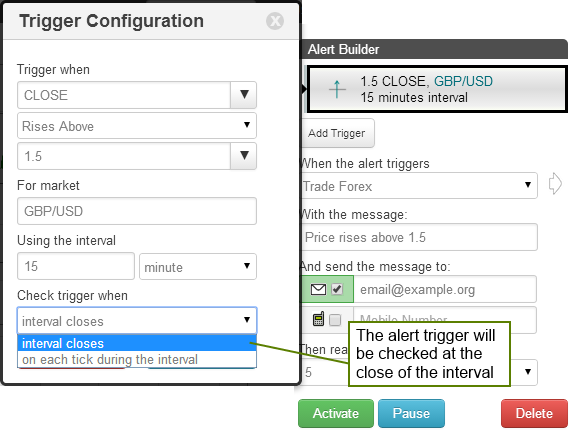 The following provides an example of how some of these alerts can be set up using timetotrade. The best part is that you don't need to know how to code or use complicate user interfaces to do it - just point and click using the Timetotrade Trigger Trading Technology™. You can set up alerts to notify you, or execute trades, for example when the RSI rises above 30, falls below 70, breaks-out or pulls back. You can combine the RSI if other indicators, such as the Moving Average to create multi-condition alerts. Click here to open a FREE timetotrade account today and access Price and Technical Indicator Charts and create alerts on Forex, Precious Metals and Shares. timetotrade watches the markets, so you don't have to. Use timetotrade to avoid missing trading opportunities, regardless of how busy you are ...and when it's time to trade we'll let you know! To create an alert, go to the timetotrade CHARTS page >> , and enter the ticker symbol for the stock or currency pair you wish to follow. Use the chart settings to add the RSI chart and adjust the RSI parameters. You can adjust the default period and interval parameter values to find the best fit between price movement and the RSI indicator. The default period setting is RSI (14), but you can change the period to suit your trading preferences using the chart settings. 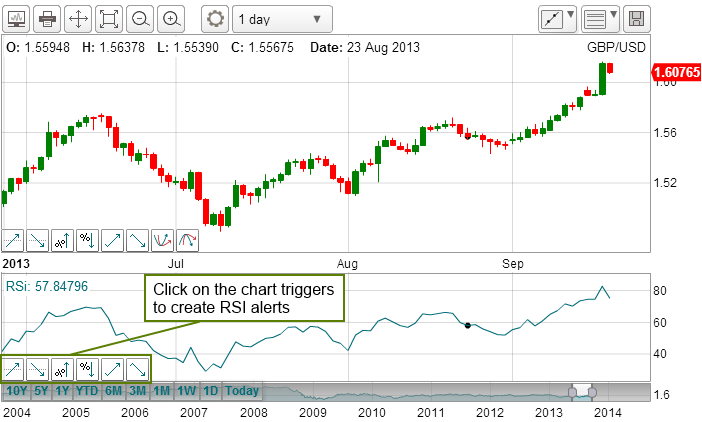 To create an RSI Alert, just click the Alert Trigger button in the bottom left of the RSI chart. There are no programming languages to learn, no macros or complex formulas for you to write. Just click a button, enter your parameters, "add the trigger" and "activate" and your alert is created. Simple! Rising Threshold Alert Trigger, is triggered when the value of the RSI rises above a specified value. Falling Threshold Alert Trigger, is triggered when the value of the RSI falls below a specified value. Break-Out Alert Trigger, is triggered when the RSI increases by a specified value within a the selected interval period. 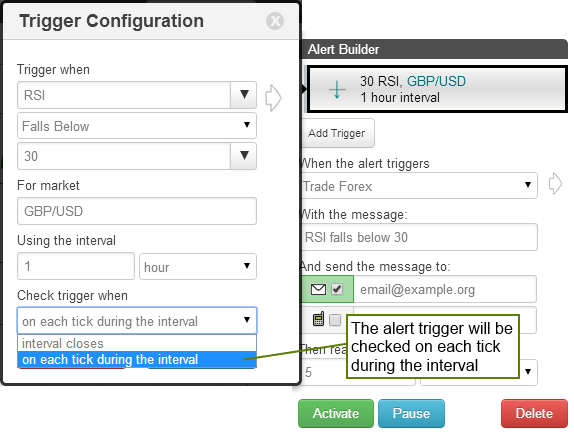 Pull-Back Alert Trigger, is triggered when the RSI decreases by a specified value within a the selected interval period. Percentage Break-out Alert Trigger, is triggered when the RSI increases by a specified value within a the selected interval period. Percentage Pull-back Alert Trigger, is triggered when the RSI decreases by a specified percentage within a the selected interval period. Above Alert Trigger, is triggered when the RSI is above a specified value. 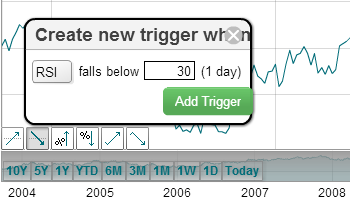 Below Alert Trigger, is triggered when the RSI is below a specified value. Positive Crossover Alert Trigger, is triggered when the RSI rises above / crosses over another indicator, price, a specified value or trend line that you have drawn on the chart. Negative Crossover Alert Trigger, is triggered when the RSI falls below / crosses under another indicator, price, a specified value or trend line that you have drawn on the chart. To create an alert that will be triggered and notify you, or execute trades, when the RSI rises above a certain value, just click the RSI "Rising Threshold" Trigger button as shown below. This opens up a text box on the RSI chart. The alert condition will then appear in the "Alert Creation" box on the right hand side of the chart page. Here you can customise the alert to suit you: for example you can personalise the alert message you will receive, decide how you would like to be notified and where you would like the alert sent. You can choose to have the alert sent to your email and/or mobile phone. And that's it! Your alert is set up. It really is that simple. The next time the RSI rises above, eg 70 you will be notified by an alert sent to your email or cell phone. As in the previous example, input the value you would like to be alerted that the RSI has fallen below, (eg 30) and customise and "activate" your alert as previously described. The next time the RSI falls below your specified value, you will be notified by an alert sent to your email or mobile phone. To create an alert that will be triggered to notify you, or execute trades, when the RSI increases by a certain amount, just click the RSI "Break-Out" Trigger button as shown below, input the value you wish to see the RSI increase by, and customise the alert to suit. Remember to click the "activate" button. 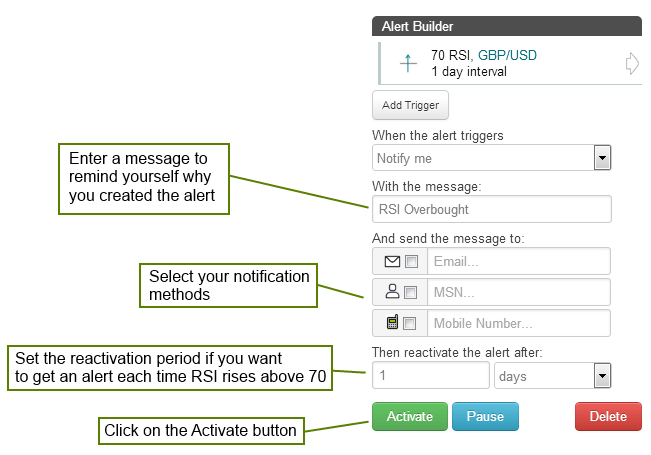 The next time the RSI increases by your specified value, you will receive an alert to your email or mobile phone. To create an alert that will be triggered and notify you, or execute trades, when the RSI decreases by a certain value, just click the RSI "Pull-Back" Trigger button as shown below, input the value you wish to see the RSI fall by, customise and "activate" the alert. The next time the RSI decreases by your specified value, you will receive an alert to your email or mobile phone. 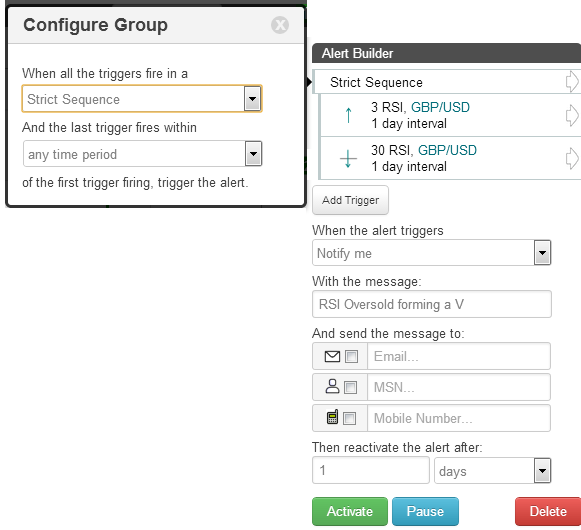 Multiple RSI triggers can be combined to create an alert. For example an alert can be created to provide a notification of when the RSI is oversold below 30 following by a breakout change of trend forming a V.
To learn more about Sequencing multiple alert triggers click here. Activate the alert and the next time your RSI Oversold Chart conditions are met, you will be notified. You can also back test your RSI alerts to check that they have been set up correctly and test trading strategies. Click here to learn more about backtesting your alert based trading strategies using timetotrade.